A 55-year-old man with a history of asthma, chronic kidney disease and hypocalcemia presented with dyspnea and hypoxemia to the Emergency Room. The patient reported cough, purulent sputum production, and fever. His symptoms began 3 weeks prior and he was diagnosed with pneumonia by his outpatient pulmonologist. He completed a 10 day course of treatment with Moxifloxacin once daily, but his symptoms did not improve. The patient carried a diagnosis of Kenny-Caffey syndrome, an extremely rare form of congenital hypoparathyroidism. To prevent episodes of hypocalcemia, he was maintained on 1500 mg of daily calcium supplementation and 400 mg daily of magnesium. He was compliant with these medications. On physical examination the patient appeared ill due to tachypnea and required 4 Lpm of supplemental oxygen to maintain oxygen saturation > 90% by pulse oximetry. Eye exam revealed bilateral cataracts. The patient had short stature and mild dysmorphism of the face. Pulmonary exam revealed bilateral rhonchorous breath sounds and diminished air flow. The rest of the examination was unremarkable. A chemistry panel revealed serum creatinine 1.7 mg/dL, white blood cell count of 16,100 and serum calcium 10.3 mg/dL. 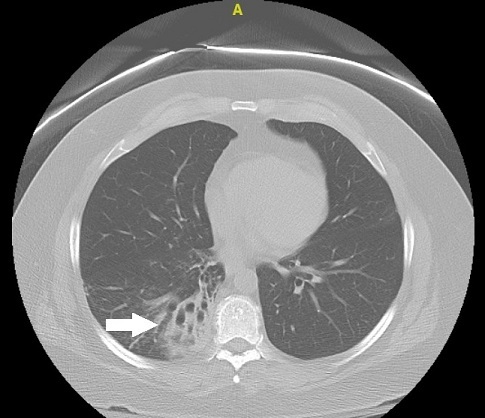 Chest radiography revealed right lower lobe (RLL) air space disease. CT Chest revealed dense consolidation in RLL with evidence of bronchiectasis (see figure). The patient was admitted to the medical ward and treated for community acquired pneumonia with IV ceftriaxone and azithromycin in addition to IV hydration. He rapidly improved. Blood cultures showed no growth and legionella antigen was negative. It was believed that his antibiotic failure in the outpatient setting was likely due to an interaction of Moxifloxacin, a fluoroquinolone antibiotic, and divalent cations contained within the patient’s daily calcium and magnesium supplements. Fluoroquinolone antibiotics have an important interaction when taken concomitantly with divalent cation-containing supplements such as calcium and magnesium. Fluoroquinoles are chelated by metal cations in the GI tract and have decreased intestinal permeability leading to unpredictable serum and tissue levels. Although other reasons were considered, the interaction between Moxifloxacin and the patient’s calcium and magnesium supplements likely led to treatment failure. Bronchiectasis may have developed as a result of delayed treatment of pneumonia. Kenny-Caffey syndrome is an extremely rare form of congenital hypoparathyrodism associated with corneal and retinal calcifications, congenital cataracts, and deficient T-cell immunity. Although Kenney Caffey syndrome is rare, calcium supplementation is common as is fluoroquinolone use. Fluoroquinolone antibiotics are bound by cation-containing agents such as calcium supplements, which may lead to decreased absorption and treatment failure. Hospitalist physicians must be aware of this important medication interaction. Finn A, Dapaah-Afriyie K. Bound to Fail: Fluoroquinolone Antibiotics and Calcium Supplementation. Abstract published at Hospital Medicine 2016, March 6-9, San Diego, Calif. Abstract 506. Journal of Hospital Medicine. 2016; 11 (suppl 1). https://www.shmabstracts.com/abstract/bound-to-fail-fluoroquinolone-antibiotics-and-calcium-supplementation/. Accessed April 26, 2019.